Inside this cookbook you will enjoy delicious recipes that will make your family and friends mouth water! Another great cookbook, Eileen! I see a recipe that I'm going to make for sure! LOL!! 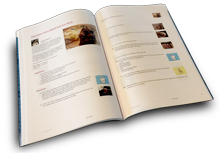 Thanks for adding my Steak De Burgo recipe to your awesome cook book!